A forecast Map for J-1 . Click here for larger View. This season's first snowfall in Arunachal Pradesh occurred at the picturesque Tawang town situated 10,200 feet above sea level. The low temperature plummeting to -6c. “After recording the season's heavy snowfall since Sunday, life was thrown out of gear. Sela Pass at a height of nearly 13,700 feet on the Bomdila-Tawang road, was covered with three feet of snow in the last three days.Heavy snowfall blocked the road at Sela Pass yesterday. On Sunday and Monday, the hills around Darjeeling received the forst snowfall. Tiger Hill had snow. Darjeeling had a high of 6.8c and a low of 1.5c on Tuesday. Mumbai recorded a minimum of 17c at S'Cruz and 20c at Colaba. This was expected, as mentioned in the last blog article. However,the city will see night temperatures dropping from 7th Jan.
Pune will also feel the cold after 7th Jan.
Mark Vogan gives an outstanding account and details of Gale wind Storms in U.K., with videos...dont miss it, see here. you except the temp in mumbai to go below 10?? 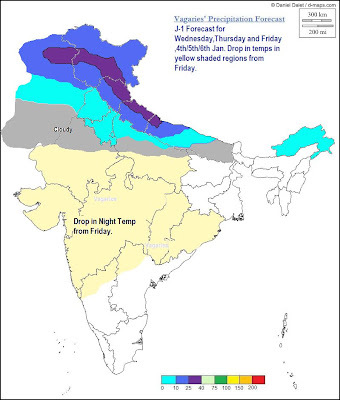 sridhar: The minimum temp at S'Cruz could be around 12/13c between 7th to 10th Jan.
Pune could go below 9c.